It's easy to get lost in the debate over carpet and wood flooring combinations. Questions like which one is better, can you have both, design taboos when trying to have them, etc. We know there are traditions to design and trends, but there are classic dos and don'ts when it comes to having carpet and wood flooring together. Almost like ground rules when mixing up the flooring in your house. Sure, a lot of it is about what you need and your tastes. But, if struggling with how to have that striking look or deciding if it's even right to have carpet and wood flooring combinations then let's go over some of the dos and don'ts. Each kind of flooring has its benefits, no doubt about it. They offer different things functionally and design wise. So, before getting into the best to have carpet and wood flooring together, let's talk about it where they shine and each's drawbacks. Hardwood floors are easy to clean and offer the area rug option. Ever see an area rug on top of carpeting? Kind of looks like overkill. Speaking of looks, nothing says classic elegance like hardwood floors do. It's part of the reason they're so popular. For some reason, hardwood floors call to rustic or antique beauty. If that is your aesthetic, then hardwood makes perfect sense. Another reason for their popularity is their durability. Hardwood floors tend to resist stains, dust, bumps, and bags a lot better than carpeting does. A simple mop does the trick for a spill or a broom for some dirt. But, scratches and scrapes can be the undoing of a beautiful hardwood floor. The tradeoff with hardwood is the maintenance. If damaged by water or a lot of high-traffic results in scuffing of the wood, then you'd need to refinish it. Carpet brings comfort to a room and warms the feet in the colder months. It helps further insulate the house and offers another place to sit. Most people don't enjoy the harsh wood when sitting or playing on the floor and carpet removes that, almost like having a big sofa wherever you look. Speaking of socializing, another plus of carpeting is that it reduces noise. From walking and running around to just the added sounds of televisions and stereos. In a family home, the last thing you need is more echo or noise. Carpet speaks in comfy and that is a major reason why it became so popular, that and it's easy to replace as well as cheaper than hardwood floors. 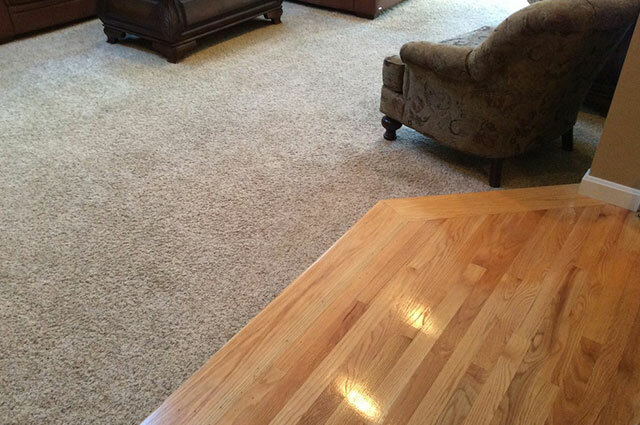 The downside to carpeting is where hardwood really shines. Carpeting is easily stained, holds odor within it, collects dirt, and gathers dust. It can easily be a messy and unhygienic kind of flooring. As you can see, the debate over carpet vs. hardwood is an easy one to have. Both, have benefits and downsides. But that is why the debate is needless. Carpet and wood flooring combinations balance each other out and better the home. As mentioned earlier, one way to have carpet and wood flooring combinations is through area rugs. It's why in homes with a lot of hardwood floors have area rugs in high-traffic spots in the home. If you're concerned about your hardwood floors getting scratched and scuffed up, lay down an area rug or hallway runner. That not only helps to protect your floors but also helps to quiet the noise. Remember that carpeting also adds warmth and a sense of coziness? Well, that's why a lot of homes will have hardwood flooring in some rooms but carpeting in the bedroom. That is where you'd want to be the most comfortable after all. But, would you really want carpeting in the kitchen or dining room? That is one place that really showcases the importance of carpet and wood flooring combinations. Carpeting in the living room but that leads into the easily cleaned and stain resistant wood flooring. Comfy to easily cleaned. There shouldn't be a debate between them, both carpet and wood flooring together make a house better. Different kinds of floors for different rooms depending on how you use them. That's the best way to do it! Even if you have a home with nothing but hardwood floors, you can use area rugs for the carpet and wood flooring combinations. Throw a large rug in the living room or in the halls to cut down on noise and help to warm them in winter. Don't put down any fancy rugs in the kitchen or bathrooms. Sensibility and utility can go with designing carpet and wood flooring together. Don't let taste rule all decision making and more importantly, don't get locked into a debate that doesn't need to be had.